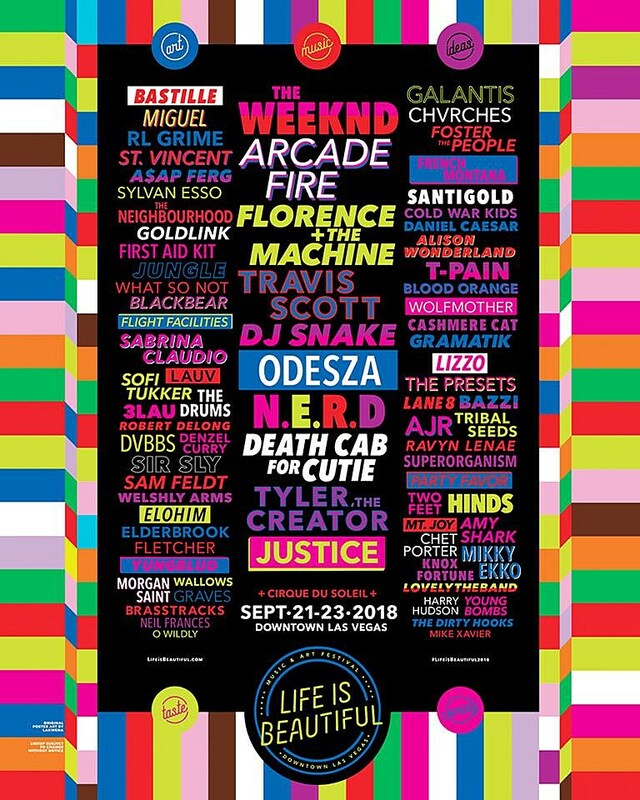 The annual Life Is Beautiful festival returns September 21-23 to Downtown Las Vegas, and the 2018 lineup includes Arcade Fire, Florence + the Machine, The Weeknd, Travis Scott, DJ Snake, ODESZA, St. Vincent, Phantogram, Hinds, A$AP Ferg, Sylvan Esso, Lizzo, The Presets, Tyler the Creator, T-Pain, Death Cab For Cutie, Santigold, Denzel Curry, Blood Orange, Wolfmother, Justice, Miguel, RL Grime, N.E.R.D., Ravyn Lenae, Superorganism, The Drums, and much more. Full lineup below. Tickets go on sale Thursday (4/26) at 10 AM Pacific.